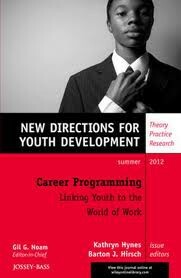 New Directions for Youth Development: Theory, Practice, and Research is a quarterly publication focusing on contemporary issues challenging the field of youth development. The journal is dedicated to bringing together everyone concerned with helping young people, including scholars, practitioners, and people from different disciplines and professions. The result is a unique resource presenting thoughtful, multi-faceted approaches to helping our youth develop into responsible, stable, well-rounded citizens. A defining focus of the journal is the relationship among theory, research, and practice. In particular, New Directions for Youth Development is dedicated to recognizing resilience as well as risk, healthy development of our youth, and the difficulties of adolescence. The journal is intended as a forum for provocative discussion that reaches across the worlds of academia, service, philanthropy, and policy. Each issue of New Directions for Youth Development focuses on a single topic of significance and importance to the field of youth development and is edited by experts in that area of study and practice. Each issue undergoes a peer review process. Past topics of New Directions for Youth Development include youth mentoring, threat and terror, immigrant youth, afterschool and out of school time, community building, youth leadership, summertime learning, spiritual development, violence and social disintegration, and youth advocacy.